Wedding bells are chiming again today on the blog and this week I am talking colour palettes. All to support the charity The Wedding Wishing Well Foundation who organise and fund weddings for terminally ill people. I love colour palette posts. Mini mood boards that are an easy way to save your favourite ideas. When my Mum married again in 2007, to my step dad, who is a life long Everton supporter, they had the Z cars song, which the players always walk out to, as their first dance! I think it's wonderful to choose a theme or colour that has great sentiment. I had baby pink, as I had pictured that being my wedding colour since I was a little girl. I had a good browse on the internet for inspiration for the Bristol couple and here's what I loved. How sweet is this photo idea?! It poured with rain at our wedding and I wish I had seen this as I would have definitely picked up a coloured brolley when we saw the forecast! The red shoes just make it. Who says rain can spoil your photos?! 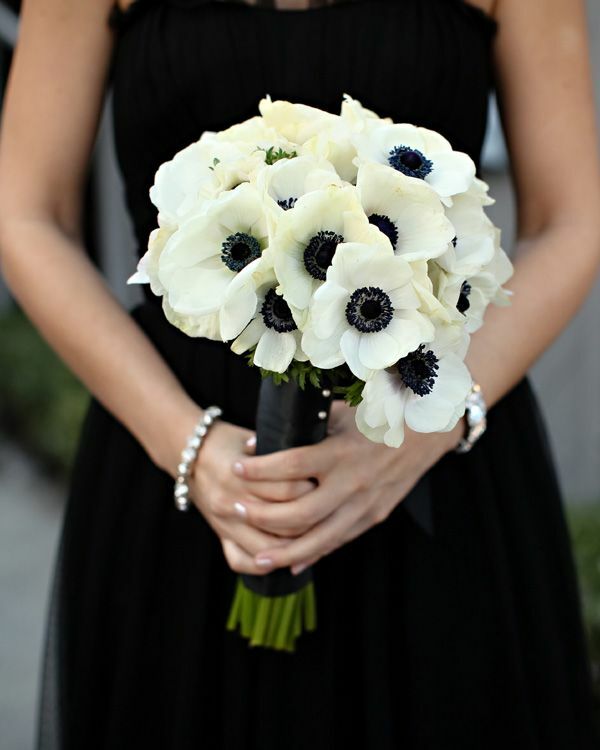 Wow - these stunning anemones make an incredible bouquet. Just imagine a thin band of red ribbon around it. This photo by Jonathan Ong makes my heart soar. You could do half of the balloons with black curling ribbon and half with white. Cakes. Oh these cakes would almost be too beautiful to eat! Works of art in themselves! I love the simplicity of the Le Petit Four white base and black ribbon icing. The chocolate cake is so indulgent, you just want to dive straight into the photo! And this place setting would almost be too pretty to spoil with a plate of food! And something for the girls?! When it comes to flowers and this colour scheme, you are spoilt for choice. These button holes made me gasp. The button hole by Calie Rose is so intricate and delicate at the same time, with the addition of non floral elements. The red hanker chief is a great way to make this button hole look even more crisp and fresh. What about a brooch bouquet like this stunner? You can incorporate some sentimental jewellery or scour the local charity shops for a beautiful bargain. These poppies look stunning against the white and black print backdrop. You could make a great photo booth backdrop with some similar print wallpaper! Lastly a floral ice bucket! Genius. And finally here is an incredible mood board of ideas by The Knot, which is an amazing source of inspiration for brides to be. So, did you start out reading this post with doubts of how stunning that colour scheme could be, or were you sold from the start?! Don't forget, every Wednesday is Wonderful Wedding Wednesday on this blog to raise awareness and donations for the charity, The Wedding Wishing Well Foundation to help as many couples have their dream day as possible, before it may be too late. Please support them in any way you can. See you next week wedding lovers!